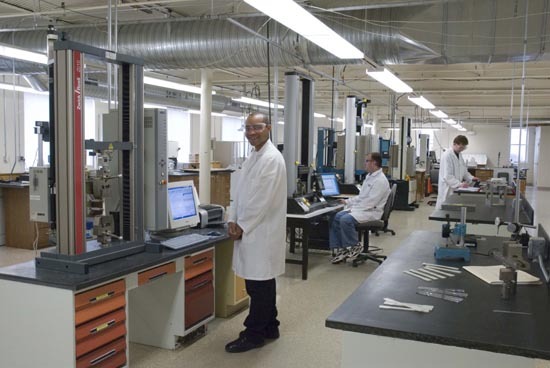 Plastics Technology Laboratories Inc. (PTLI) has just completed a major expansion more than DOUBLING the conditioned laboratory space and adding extensive capabilities to their full service plastics, elastomers, composites, and film testing services. The new laboratory capabilities include additions to physical, mechanical, analytical, rheological, electrical, optical, flammability and weathering test services and position PTLI to continue as the leader in testing for the plastics industry. The expansion aims to not only increase capabilities but also increase efficiency resulting in reduced turnaround times for customers. “In addition to testing equipment and lab space, PTLI has significantly increased customer service personnel to provide technical phone and email testing assistance to customers and reduced turnaround on test quotes and project initiation. This should assist us in meeting our customer’s needs now and in the immediate future as we continue to grow at Plastics Technology Laboratories Inc,” states Jim Beauregard President of PTLI. In addition to a full range of plastics, elastomers, composites and film testing, new products PTLI introduces with the expansion include new Machining, Weathering, Wet Chemistry, Tribology and Flame Laboratories. Machining Laboratory- PTLI now has a new and efficient Machining Laboratory, CNC machining, Bridgeport and Lathe capabilities. Joining PTLI is toolmaker David Carter who has worked in plastics machining for over 15 years. PTLI provides machined specimens from virtually any type of parent form: extruded sheet, rod, tube or profile, composite fabrication, thermoformed or injection molded part. Special machining techniques utilized by PTLI ensure low stress, smooth surfaces and uniform dimensions. PTLI’s CNC machine accuracy of +/-0.0002 inches surpasses ASTM and ISO requirements and ensures accuracy and repeatability. CNC rounds out already existing capabilities including, tables saws with carbide and diamond blades for epoxy and composites to name a few. The expansion is designed for flow-thru process to accelerate turnaround times. Weathering Laboratory- The addition of multiple Xenon-Arc machines ensure convenient access to industry specifications including SAE J1960, SAE J1885, ASTM D2565, ASTM D4459, ASTM G155 and Highly Predictive Accelerated Weathering (HPAW). Additional services including QUV, color, gloss and a full range of mechanical testing allows PTLI to provide complete weathering laboratory services. Tribology Laboratory- Tribology is the science of surface technology of friction, lubrication, and wear. PTLI performs a variety of Wear Rate and Coefficient of Friction (COF) by Thrust Washer Testing Machine (ASTM D3702). PTLI also performs COF by Universal Tester (ASTM D1894). PTLI expands capabilities regularly to meet industry and customer demands and reduce turnaround times. This recent expansion also includes: new Thermo Mechanical Analysis (TMA), new Instron/Dynatup 8250, new Universal testers and Surface Characterization by Contact Angle. PTLI continues to lead the industry in plastics, elastomers, film and composites testing. Continue to check out our website for more information on the plastics testing services provided by PTLI including our free online encyclopedia, Testlopedia®, outlining nearly every plastic test required by the plastic industry or contact us today for a free quote or more information.